The name of this temple tells the target. Sakya is the name of the order; Thegchen means Mahayana, the vehicle of the Bodhisattvas; Ling means location. Officially, the aim is defined as: to promote interest in and the study of Mahayana Buddhism by studying, practicing and propagating it and also preserving and continuing the Tibetan culture. Sakya Thegchen Ling achieves this by providing lectures, courses, study evenings, information and education and by translating original Tibetan Buddhist texts. 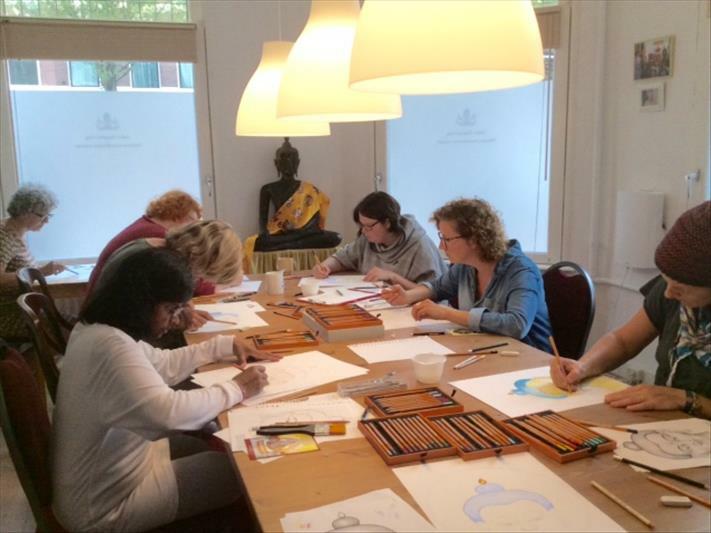 The Sakya Institute is the only center of the Buddhist order in the Netherlands. Since the exodus of thousands of Tibetans from Tibet in 1959, His Holiness the Dalai Lama gave his full attention to the preservation and continuation of Buddhism and Tibetan culture. Similarly, His Holiness the Sakya Trizin, the head of the Sakya order, created a foundation, after his flight to India to safeguard the unique philosophical and meditative tradition of the Sakya order for his followers. He founded a new Sakya Monastery in 1964 and in 1980 the Sakya Thubten Namgyal Ling Institute, a school for monks. These became the new shelters for the Sakya order, a tradition dating back to 1073.